1. 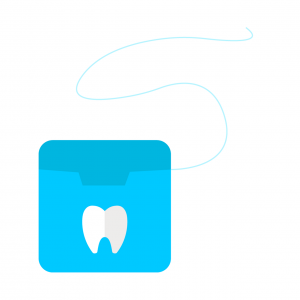 Floss before you brush: This helps loosen up particles that can then be removed by brushing your teeth afterwards. 2. Floss before bedtime: you don’t want to go to bed with particles in between your teeth… as we sleep, our saliva is not working like it does during the day; it’s best to clean out those food particles from in between our teeth prior to hitting the pillow. 3. Help beat bad breath with regular flossing: This will help get rid of the bacteria and plaque between your teeth that can cause bad breath and if, left alone, can lead to a whole host of other problems. 4. Help fight gingivitis and periodontal disease: When you don’t floss or brush your teeth enough to remove the bacteria and plaque, your gums can become inflamed and pockets can form between your gum and teeth; these spots are great places for bacteria to hide out, which may lead to periodontal disease. 5. Use about a foot to 18” inches of traditional floss: if you are not using one of the newer “pick” style flossing tools, roll out about a foot and a half of the string style and wrap the excess around your finger, using about one to two inch sections to floss between each tooth… and remember to use a clean section for each tooth gap. Also, always make sure you visit your dental professionals at Longmeadow Family Dental Care for regular checkups. Keep these tips in mind and you’ll sleep better at night and smile brighter all day long! A term used to describe a single area, position, or locus. For periodontal procedures, an area of soft tissue recession on a single tooth or an osseous defect adjacent to a single tooth; also used to indicate soft tissue defects and/or osseous defects in edentulous tooth positions.